Rare. Sailor Jerry was in communication with many tattooers. They traded lots of designs. This sheet has a bonus of 2 drawings on the back of the sheet where he started a sheet and didnt finish. 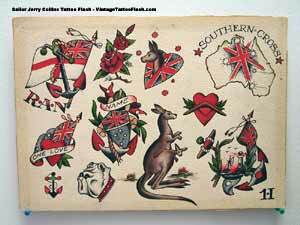 The Southern Cross is featured in one of Sailor Jerry's books.